My first product launch was chaos. The launch date moved back once and up twice. I started a week’s worth of work a day before it was due. The few precious hours of sleep I got the night before release day were full of stress dreams of missed deadlines and botched launches. In the end, the launch was a success. But I remember thinking to myself, in an exhausted and over-caffeinated daze, “there has to be a better way”. And it only took pouring over product launches from top companies, reading countless product announcement emails, signing up for multiple free trials, and scrolling through what felt like 26.2 miles of product landing pages to figure it out! We (that’d be me and the rest of the Appcues marketing team) discovered that there’s actually a formula that viral product releases tend to follow. To take the guesswork out of launching, we even made this spiffy Product Launch Planner. It automatically adapts the winning formula to your own product and gives you a customized timeline for your next launch. In this article, we take a closer look at the most important steps to follow for a successful product launch plan. These 8 steps combine the psychology of excitement with tried-and-true release tactics to help you deliver your most viral product launch yet. First things first. What will a successful product launch look like to you? Do you want signups? Downloads? Views? Take some time to think about how you should be measuring success, then identify your north star metric. This metric should inform both the language you use to talk about your launch, and the way you view your final numbers. Once you’ve determined which metrics you’ll be measuring and optimizing for, you should set some goals. Try to use historic data if possible—for example, if you had a similar launch that got you 400 signups, then 400 or 500 signups is probably a good goal to start with. Your goals should be ambitious but attainable. Product messaging is both an art and a science. Generally speaking, the language you use to talk about your product should be clean, concise, and consistent. To determine what your messaging will be, talk to your product team and product marketing manager. Think about what sets your product apart from the competition, what customer pain points it solves, and so on. Dig into any support tickets or customer feedback channels you might have to find out how your customers talk about the problems your new product will solve—then use that same language in your launch copy. Once you’ve settled on messaging, make sure to convey it to your marketing and sales teams. This will help keep the language you’re using to communicate with your customers consistent across channels. Your new product should have its own landing page on your company website. This page should be where you drive your traffic in the steps to come. Keep this page short and sweet. Don’t overload people with too much information—focus only on what potential users need to know about what your product is, what problem it solves, and who it’s for. Similarly, avoid unnecessary or superfluous calls to action—devote your CTAs to a single action. Pictures of your product, an explainer video, and quotes beta users are all great ways to increase page conversions. Use ‘em if you got ‘em. Once you’ve hammered out your goals and messaging, you should start teasing your product launch. In the weeks leading up to launch day, seed your blog with content that addresses the problems that your new product is designed to solve. 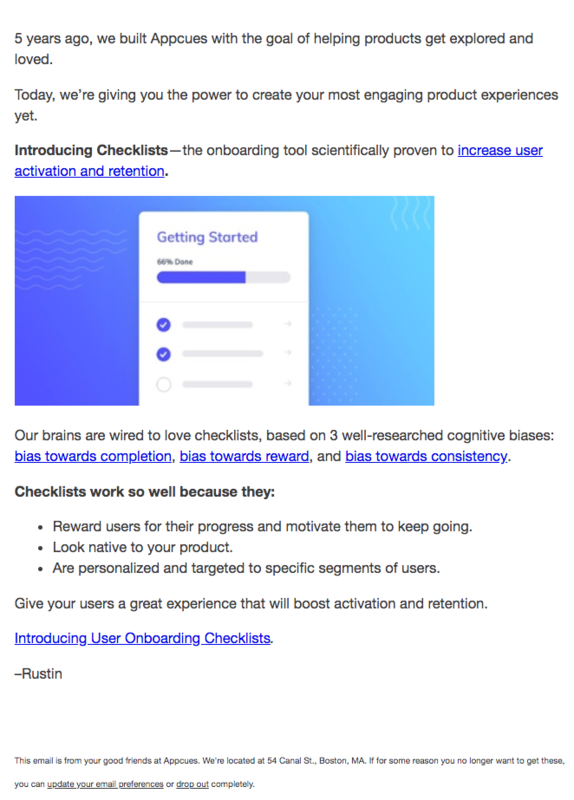 For example, before the official launch of the Appcues user onboarding Checklists, we published a post explaining the psychological benefits of using checklists to guide completion of complicated tasks. Pre-launch content works by priming your audience; when people are invested in the problems your company is trying to solve, they’re more likely to see the full value of your new product. You should also publish on launch day, or shortly thereafter. Use this blog post (ideally written by your CEO or product team lead) to talk about your company’s vision, the pain point you set out to solve, and how this new product will address that problem. Be sure to include a CTA to try out your product, and link it to the landing page you built in the last step. You knew this one was coming...it’s in-app messaging time! 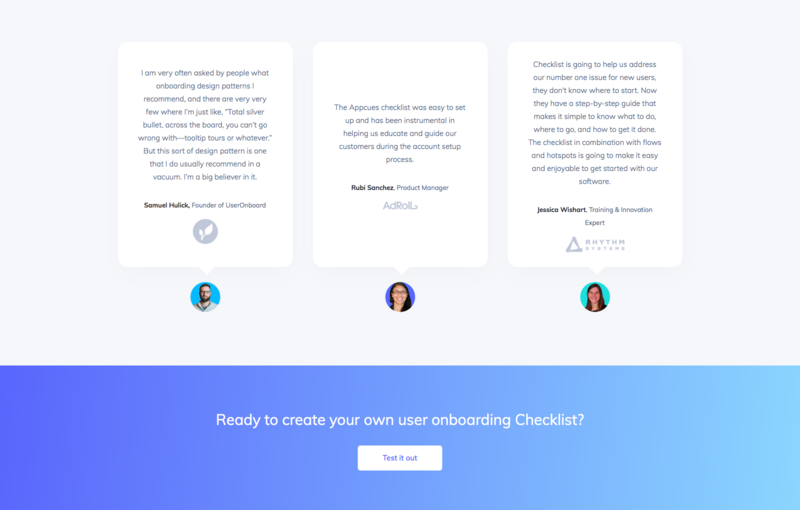 And yes, even great products need a little user onboarding. In-product messaging doesn’t have to be complicated (in fact, it shouldn’t be). 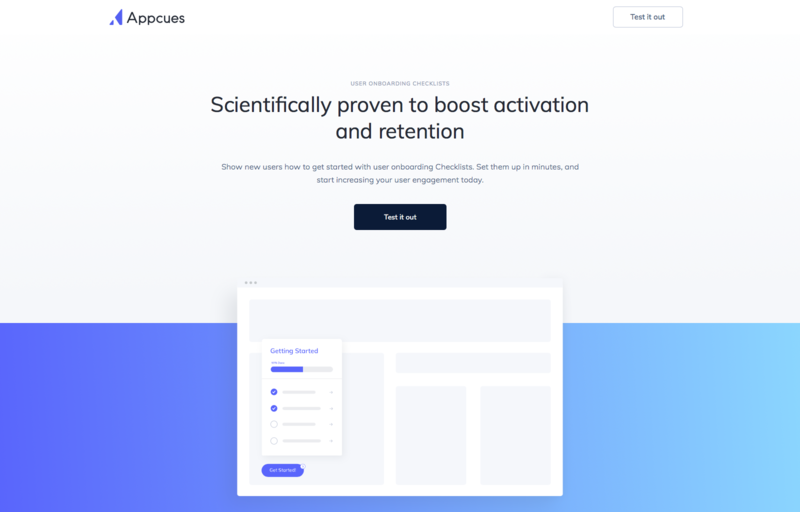 A few concise and thoughtful tooltips here, a modal introducing your new product there—these little bits of communication can go a long way toward reducing churn and making sure users stay with your product long enough to realize its value. You can read all about how to use in-app messaging for timely and contextual communication here. Launch snobs be damned, Product Hunt is still the best place around for launching a new product. It offers an opportunity to net massive exposure to an entirely new audience for free. To give yourself the best chance for success on the platform, be sure to include eye-catching graphics (gifs if you’ve got ‘em! ), and a strong title and tagline. Oh, and don’t expect an early night’s sleep—post your product at 12:01 PST to maximize exposure. The best way to reach out to your existing audience is through their inboxes. Send a carefully crafted announcement email to the leads in your database who you think will be most receptive to your new product. One way to do this is to first segment your database by blog subscribers, content signups, free trialers, and existing customers. Then, further divide each of these segments into smaller ones, based on topics of interest. This strategy lets you tailor your subject lines and email copy for maximum effect. As any every marketer know, an email’s subject line can make or break its success. Make it too bland, and it will get overlooked; too salesy, and you’ve bought yourself a one-way ticket to the junk folder. Aim for a subject line that catches the eye and teases out the idea of your launch, but leaves the reader wanting more. The body copy should be punchy and to the point. Start with a strong hook that sets the stage for your big announcement. Then, briefly explain the problem and how your new problem will solve it. Finally, wrap it all up with an irresistible CTA that directs the reader to the landing page you made in step 3. If you can only do one thing product launch tactic well, it should be this: Make sure your entire team is aligned on the importance of the new product, the messaging around it, and the goals of the launch. Your sales team will be the ones talking directly to prospective customers so give them all the tools they need to succeed. This often takes the form of a one-pager summarizing everything sales needs to know in order to successfully sell your the new product—including value prop, the problem the product solves, how it stacks up to the competition, etc. And don’t underestimate the importance of educating the the rest of your team, even non-customer facing folks in engineering and dev. Understanding the value of the product and how customers respond to it will better inform future developments. What’s more, team-wide alignment will get your whole team excited and invested in the launch. This type of energy invariably results in better design, better customer interaction, and a stronger social media presence when you finally blast out the product launch. These 8 steps will set you up for success, but they’re just really the beginning. The best launches also involve writing help center documentation, setting up paid ads, hosting webinars, and a whole lot more. And remember: Any product launch is going to involve some trial and error. For instance, you will find that certain outreach channels work well for your audience, while others fall flat. Don’t despair! Record the results of your efforts so you can adjust your strategy for your next launch. Eventually, you’ll hit upon a system that works for your company, your team, and your customers. Ahem. Want help planning the perfect product launch plan? 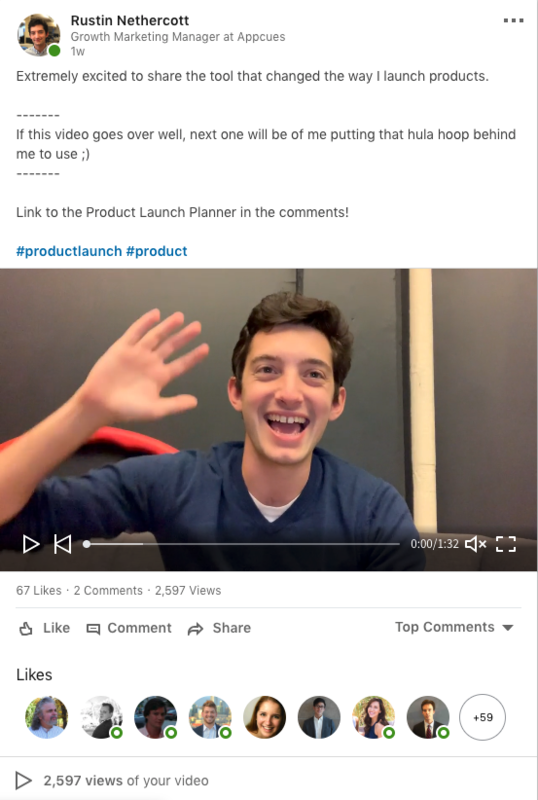 Not to harp on about it, but... the Appcues Product Launch Planner is an easy (and totally free!) way to get started.